Led by Andy Serkis, the apes take their revenge against the human race. Rise of the Planet of the Apes is not necessarily a bad movie; just an uninspired one. It brings nothing new to the table. Sure, maybe this just isn’t my kind of movie, and I’d agree with that, but I don’t think that my rating is utterly wrong. You’ll see from the movie posters that it stars James Franco. He’s been the main one getting a lot of praise. But while watching Rise of the Planet of the Apes, you’ll soon realize that it doesn’t really star him at all. In fact, it stars Andy Serkis as Caesar, the ape. Franco is barely in the movie at all. I don’t think I need to get into the plot. It’s a prequel to The Planet of the Apes, so you know what to expect. Man treats the apes like crap, apes get back at man. It’s kind of like an allegory for slavery or the inhumane treatment of animals. First off, I’d like to talk about the writing. Oh dear God, the writing. What a sorry and pitiful excuse for a script. I honestly don’t think I’ve ever seen a script so cliched and predictable (Is this a Michael Bay film?). I mean, there’s even a scene that involves a playground where the bully of the block decides to take a go at the new kid. And it’s between two apes! Following a formula is not always a bad thing. Some movies actually require one. But you have to spice it up a little. You can’t just follow it verbatim. The number one failure of this film is the predictability of the script, not to mention the cheesy dialogue. I mean, I realize that this movie is about apes and has to be about them in order to work. But was it absolutely necessary to put them in human situations? I understand that they all “super genius” monkeys, but I couldn’t take any of it seriously. It was stupid. As for the direction, Rupert Wyatt doesn’t really do anything different. It’s the same stuff we’ve seen over and over again and it doesn’t get any better or more creative. The special effects are fine, but nothing nearly as great as you’ve been led to believe. This is the kind of movie that relies on good visuals to make its money back at the box office and they just don’t really cut it, especially since the rest of the movie is bland. A redeeming quality was the performance from Serkis, who is used to playing characters like this. The movie theater crowds can barely even associate his name with a (human) face. He does great here, really making us think that we’re watching a live monkey. It’s not likely, but there’s a chance he might get nominated for an Oscar. 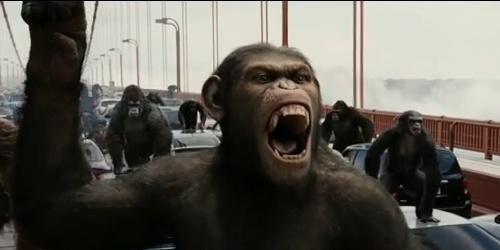 At the end, Rise of the Planet of the Apes is cheesy, cliched, and filled with unintentional laughs. Don’t see it unless you’re a die-hard fan of the series. And even then, still don’t.